Here is the story of Pooja and Muraripost-wedding shoot Pooja Μrari ’s pre-wedding shoot was so delightful a view to fall for. Their excitement levels, happiness in accomplishment and blooming love, of course, was worth a watch. They’re yet another couple who believe in miracles and make them happen. Pooja Μrari’s pre-wedding shoot at Goa It was all that a to-be couple will wait for. The chemistry they shared and the smile they wore was all indeed worth a million clicks. It was thus an experience so everlasting and beautiful. And yes we needn’t have to wonder any further because whenever they looked at each other, love and togetherness roared like a fighting fire. . Completely chilled out they were and posed together like this was all they were waiting for. We are couldn't just keep away our eyes from the blooming beauty of love and togetherness. A happy couple they seemed to be and we wish the same to them now and forever.we made the couple so much at ease that they gave their romantic best before the camera. Wishing your love bloom by every passing day, Pooja and Murari , you guys make an aww-adorable couple! Here is the story of Leela and prasad post-wedding shoot A beginning so worthwhile! Because they believed, together is a wonderful place to be. Leela and Prasad our newly married Couple, delightful of the forthcoming life and overwhelmed at the alliance. And yes we needn’t have to wonder any further because whenever they looked at each other, love and togetherness roared like a fighting fire. For their love of Vijayawada, a post-wedding shoot at Bhavani Island was thus a visual treat. Completely chilled out they were and posed together like this was all they were waiting for. We are couldn't just keep away our eyes from the blooming beauty of love and togetherness. A happy couple they seemed to be and we wish the same to them now and forever.we made the couple so much at ease that they gave their romantic best before the camera. Wishing your love bloom by every passing day, Leela and Prasad, you guys make an aww-adorable couple! Bride: A woman with a fine prospect of happiness behind her. This wedding is a unique experience too us. There were different kinds of love present there... there was the romantic love of the couple, the love of parents and children, of brothers and sisters and family, and love among friends. All of them present to solidify this bond, as these two individuals are joined as husband and wife. Present day weddings are more than just rituals, they are packed with total swag… The spectacular themes, bright hues, coordinated costumes and colors, rooms full of flowers and glitter and of course the bride and groom dressed like prince and princess! Harika's wedding had it all. Not very often you find a family that gets easier and actively involved in the photo shoot and the fact that Harika and her family eased themselves into the shoot and made everyone around them comfortable made the photo and video shoot a lovely experience to us. Thank you, Harika and family :) We are looking forward to work with you again & again We wish you guys the most incredible experience ever – Of love, of laughter and life itself! 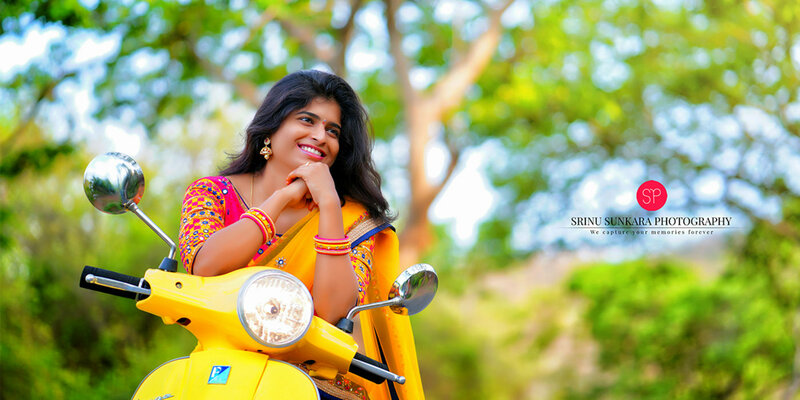 Hi guys my name Srinu sunkara I'm a professional wedding and commercial photographer based in Vijayawada, AP. We are specialize in wedding photography and wedding cinematography we never fail to impress people with our quality and friendly services. Our Photography offer wedding photography that is tranquil, contemporary and classy. On one of the most special days of your life, we capture moments, people and you which make your wedding day so special. We believe that it’s an honor to photograph a wedding ceremony. Our Photography not only concentrate on big things but focus on the minute details and moments that are generally missed in a traditional photography. we specializing in Indian Wedding, Engagement, Tamil Wedding, South Indian Wedding, Theme Wedding, Concept Wedding, Brahmin Wedding, Contemporary Wedding , Marwadi Wedding, Couple Portraits, Reception, Candid Wedding, Hindu Wedding, Muslim Wedding, Christian Wedding, Sikh Wedding, Jain Wedding, Pre-wedding Shoots, Bridal Portraits, Destination Wedding, Wedding, Model Portfolio, Portraits, Show & Pageant, Celebrity & Glamour and Fashion & Portfolio photography. We offer products and services such as Blueray Disc, Cinematography, CD / DVD, Enlargement, HD Videos, HD Highlights, Photobook, Poster, Live Streaming, Promo Videos, Frames, Shortfilms and Calendar. We accept customized photography requirements. Our studio is in Vijayawada. We cover events in Andhra Pradesh, Karnataka, All Over India and Central India. We are comfortable communicating in English, Hindi, Telugu and Tamil. We LOVED working with Srinu sunkara on our special day. He met our every need! He was so courteous with our videographer which was so important to us! He made everything so easy throughout the whole day and made sure we got all the photos we wanted! I am so glad we chose Srinu sunkara Photography! He can literally make any image you have in your mind a reality and makes it so much fun. I had the BEST time getting my wedding pictures taken by Srinu! he is great at what he does, he has an upbeat personality, and he has done an amazing job capturing the memories of our big day! I would definitely work with him again in the future (family portraits), and I recommend her for anyone out there who wants to be wowed by their wedding photos! We had so much fun getting our engagement pictures taken by Raju with Life Writing Photography. he is professional, creative, talented, very reasonable, and so easy to work with. The pictures were sent to us almost immediately after the photo shoot. They all turned out beautifully! Each picture perfectly captured the emotion of the day! You will absolutely love your experience with Raju and his team! I can't wait to use Life Writing Photography again! BEST around! Srinu sunkara IS AMAZING!!! Talented, patient, creative...not to mention he is the NICEST PERSON EVER. My sister wedding photos turned out better than we could have ever hoped! srinu and his team captured every single moment and detail of our big day perfectly. We had SO MANY great shots from our wedding - I don't think there was a single photo we didn't love. I can't say enough great things about this photographer.You will not be disappointed with Srinu and his team. Excellent service, great to work with, the best quality of pictures! Overall I am totally satisfied with Srinu.He is very professional and will make the best out of your Big day! Life Writing Photography. Excellent photography,i have wonderfull memories sharing through your photography,each and every movement captured your photography.i think you have bright future in photography field. Srinu sunkara Is AMAZING!!! Talented, patient, creative...not to mention she is the NICEST PERSON EVER.Of course he is my family friend. Our photos turned out better than we could have ever hoped! Srinu captured every single moment and detail of our big day perfectly. We had SO MANY great shots from my brother wedding - I don't think there was a single photo we didn't love. I can't say enough great things about this photographer. Srinu and his team won us over with her sweet disposition, flexibility and his amazing eye for detail and framing. Srinu took My brother engagement photos (btw he knows all of the best locations) and He took My brother wedding day photos...we liked her so much we even did a one-year photo shoot for our Christmas card! he will be the first person I call for maternity or family photos too! You will not be disappointed with Srinu & Life Writing Photography. Your message was successfully sent to Srinu Sunkara Photography. The Photographer may contact you soon.